An ex-Navy Officer Explains Why "English-Only" Is Important; etc. According to the article, House Speaker Nancy Pelosi and the House Hispanic Caucus have jumped into the lawsuit-fray by opposing a Senate amendment sponsored by Sen. Lamar Alexander that would protect businesses from the EEOC. The article also details the ugly confrontation between non-Hispanic Democrats and the Hispanic Caucus. House Majority Leader Steny Hoyer, a moderate Democrat from Maryland, confronted two reconquistas, California's Joe Baca and Illinois's Luis Gutierrez, reminding them that their objections to English only would: "destroy the party. This will be the worst loss in ten years." But the reconquistas held firm with their usual whining. Baca: "This [English-only] is against me. This is against me personally..."
Gutierrez said that English-only efforts were symbolic of "bigotry and prejudice"
For everyone like Baca and Gutierrez who oppose assimilation, I'd like to share my 20 years worth of experiences in the U.S. Navy. When I first joined back in 1987, I was stationed aboard a warship home-ported in Yokosuka, Japan. The ship's crew had a considerable number of Filipino sailors. At the time, we the U.S. had a special agreement with the Government of the Philippines that allowed Filipinos to serve in the American military. Most enlisted in the Navy. We had signs posted on the mess decks of our ship that read, "No Tagalog, Speak English Only!" The reason is obvious. We couldn't fight together if we couldn't communicate with one another. Some (like the EEOC) might make the argument that as long as the Filipinos could speak English during battle, they should be allowed to speak Tagalog during meal hours. But that would have been counter-productive to unit cohesion and our sense of trust and loyalty to one another. Sailors don't just fight on the ship. We eat together, stand watch together and live in close quarters together at sea. Therefore, it is essential that everyone conforms to a standard—and that includes speaking English. Mastering English helped the Filipinos become terrific sailors—faithful to the core from the bottom ranks on up. They made especially good Chief Petty Officers because they were no-nonsense guys who got the job done. Many became proud American citizens. The language signs on Navy warships have been taken down, in part because there are fewer Filipinos today than there were two decades ago. But learning English helped the Filipinos assimilate not only into the Navy's culture but also America's. Baca, Gutierrez and all the other advocates of multiple languages should pay attention to that lesson. Thomas lives in the Washington D.C. area. He received a BA in history from Old Dominion University in Norfolk, VA and an MA in National Security from the Naval Postgraduate School in Monterey, CA. Thomas specializes in Christian-Islamic relations and politics. While I agree in principle with Vallejo's recent letter stating that people should be treated as individuals, I point out that the relevance of group membership is not zero. This is supported by the well-known statistical phenomenon of regression towards the mean. The practical application of this is known as Kelley's paradox. Politically correct dogma is captured in the so-called 'striver's scenario', where standardized scores or test results for under-achieving minority students are supposed to under-predict their potential. "It stands to reason that a student from a materially and educationally impoverished environment who does fairly well on the SAT and better than other students who come from a similar environment is probably stronger than the unadjusted score indicates." In other words, according to Glazer, a black student who achieves a SAT score of 1200 should really be more qualified than a white student who achieves a SAT score of 1200, as the black student has had to overcome various society-imposed hurdles to have come so far. Had they both started off on equal footing, Glazer's thinking goes, the black student would have scored higher than the white student. A black student's "face value" score of 1200 is therefore worth more than that of a white student's score of 1200. Reality proves otherwise. As this very illuminating but technical article illustrates (see pages 10-22), when matched for SAT scores, black students' performance in college courses is much lower than that of white students. If the same predictor were applied to blacks and whites indiscriminately, it under-predicts black students' subsequent performance at all levels. This is highlighted here. Meaning this: future performance of an individual is best predicted not by that individual's score alone. A composite of an individual's score and that particular individual's group membership's average score serves as a better predictor of that particular individual's future performance. Given that blacks and Hispanics score significantly below whites in many cognitive indices, a negative weight will need to be applied when predicting their individual future performance. A spin-off from the above regression towards the mean is in the area of immigration. Even if one were to apply a uniform cutoff point as a criteria for entry, say, someone with a cognitive ability of an IQ of 120 or some other criterion that correlates with cognitive ability such as educational attainment, identical profile immigrants from different ancestral ethnic or racial or religious groups will not have identical descendant profiles, again due to regression towards different means of their respective familial or ancestral pool. "In this school district, blacks and whites who were perfectly matched for a true-score IQ of 120 had siblings whose average IQ was 113 for whites and 99 for blacks. In about 33 percent of the white sibling pairs both siblings had an IQ of 120 or above, as compared with only about 12 percent of black siblings." Since offspring are merely non-contemporaneous siblings, the inference is clear. Incidentally, this is a predictable result of regression to the mean when the frequency of intelligence-enhancing genes differs in the two populations, and is predicted by a genetic theory of racial differences. There is no environmental theory that predicts such differences in the siblings of highly-intelligent children. All other factors being equal, if a country takes the long-term view and takes into account human capital not just for the present generation but for future generations as well, group membership is not entirely irrelevant. 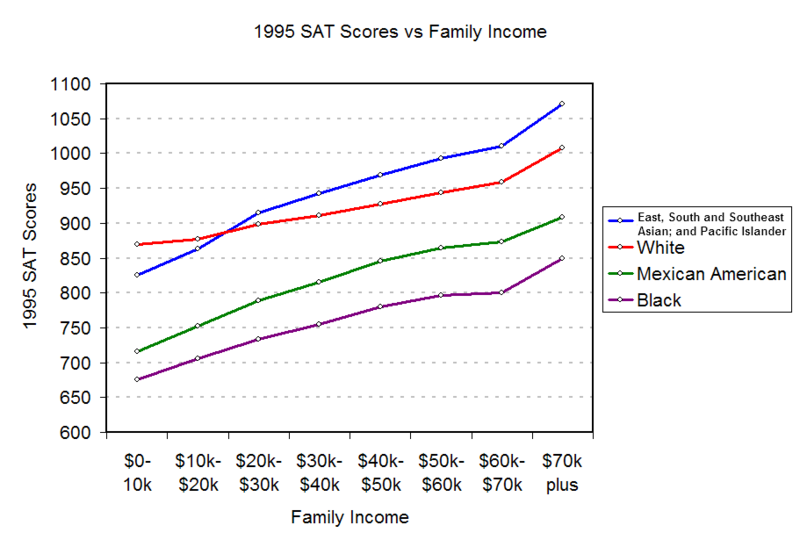 This point has been touched on in a previous VDARE article by J. Philippe Rushton demonstrating how blacks and whites regress towards their respective means, with VDARE.COM editors astutely commenting on the logical implication that affirmative action preferences cannot be a stable solution in the long term as black elite's children will not be able to take advantage of their parents' success, as well as a more recent VDARE article by Jared Taylor. The above is all borne out by data in SAT scores, a proxy for cognitive ability. Taken in total, because of huge and intractable inter-group differences, group membership is not of zero relevance in modern America. And this implies a fundamental conflict between non-discrimination (not using group membership for selection) on the one hand, and merit selection on the other. "Ben" describes himself as a former modern liberal turned "evolutionary conservative". He is of Northeast Asian descent and is a professional who is currently residing and working in Toronto, Canada. His previous letter in defense of Rushton is here. Re: Joe Guzzardi's Column: On Thanksgiving—Apple Pie Or Bust! The Nebraska Sheriff's Association has published its own cookbook featuring the best recipes of Nebraska law enforcement personnel. But what caught my eye was Hall County Sheriff Jerry Watson's "Dad's Apple Pie" According to Watson, he parted with his recipe reluctantly. Since Watson claims that: "Everyone really loves my apple pie," maybe Guzzardi should give it a try. Joe Guzzardi comments: I notice that Watson's pie has oatmeal in the crust and the topping. That, as far as I am concerned, is a no-no—way too healthy!